The EUR/USD currency pair continues moving upwards. 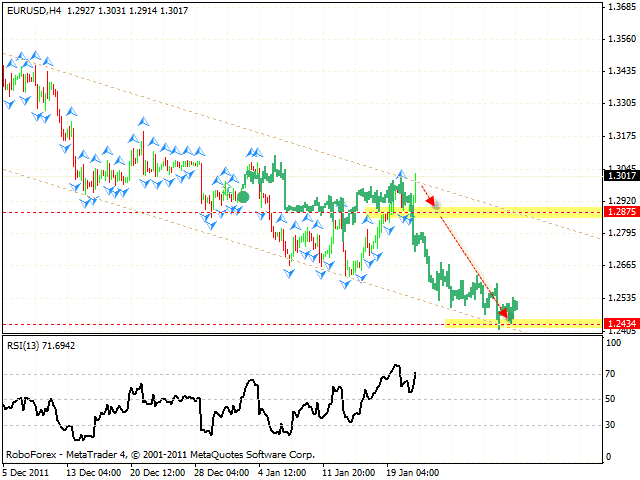 However, at the H4 chart we can see the formation of “failure swing” reversal pattern at the RSI. The target of the pattern is the area of 1.2875, and the final target of the fall is the area of 1.2434. One can consider selling the currency pair with the tight stop. 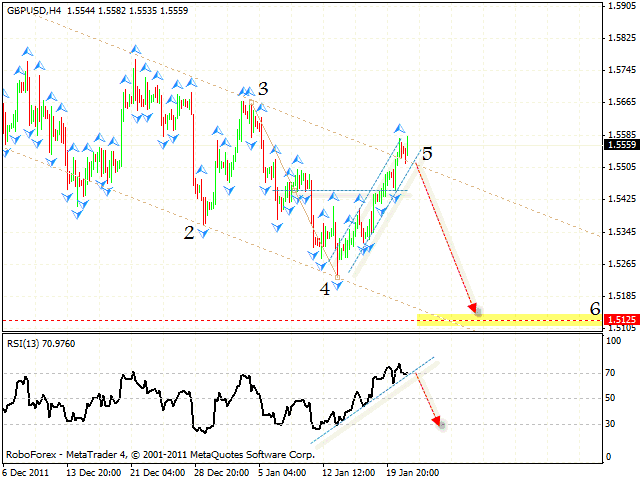 Pound has left the descending channel, however, there is still a possibility that it may fall down. One can consider selling the pair with the tight stop after the price breaks the trend’s rising line at the RSI. 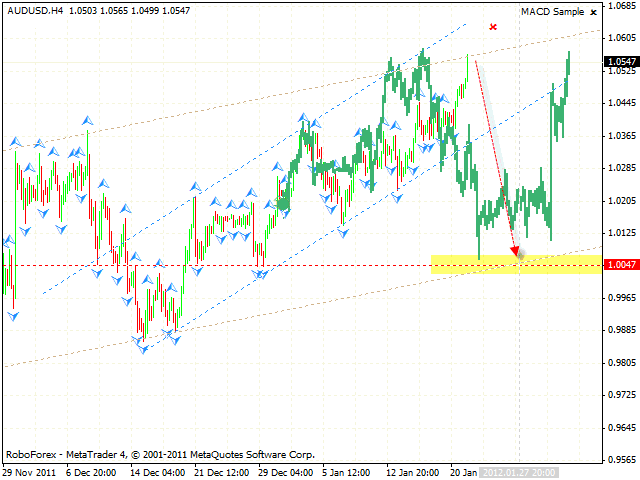 The target of the pattern is the area of 1.5125. 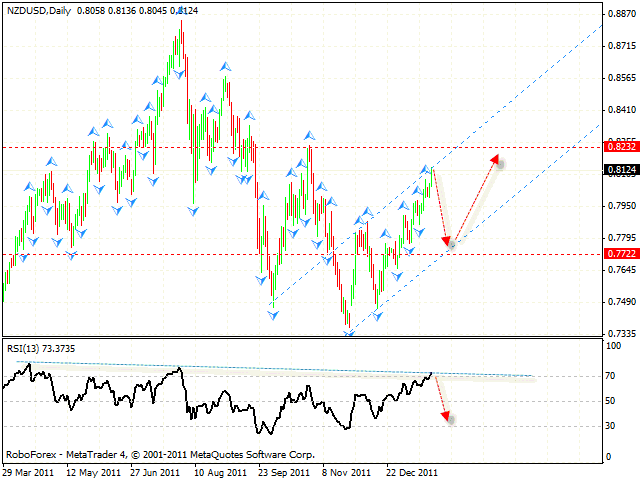 At the daily chart of the NZD/USD currency pair the RSI indicator faced the resistance from the trend’s descending line. We should expect the indicator to rebound from the line and start falling down to the lower border in the area of 0.7750, which is expect to be the starting point of the growth with the target on the area of 0.8232. One can consider aggressive sales with the tight stop. Australian Dollar is also testing the reversal area, we should expect the pair to fall to the level of 1.0047. The targets of the rising pattern have been reached, so one can consider selling the pair with the tight stop. The price is expected to reach the target area on January 27th, 2012.